The leaves are changing, the air is crisper and the mornings are cooler, which means it’s time to get your closet organized for the fall and winter seasons! It’s time to say goodbye to summer dresses and linen pants and hello to cashmere sweaters and wool trousers in just a few simple steps. 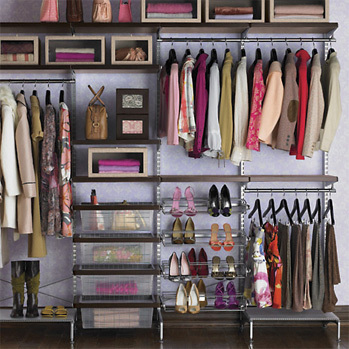 Let’s organize your closet! First, remove all distinctly spring/summer items from your closet and dresser. This is the perfect opportunity to weed out the things you no longer want/wear from the things you’ll need to clean and store. Make three piles: Store, Trash, and Donate. Store Pile: these are the clothes you will wear again next year when warm weather returns. Clean these items first. It may seem like a lot of effort, but you’ll be glad you did it when you can pull them straight from storage and into your closet! Decide what vessels you’ll use for storing the clothing and designate a place for them to live. This is a good time to use those hard-to-reach shelves at home since you won’t need to access them for months. We recommended Spacebags for traveling, and we also recommend them for storing clothing efficiently. Rubbermaid and Sterilite tubs are also a good storage solution. Consider including anti-moth/anti-insect solutions in your vessels, such as non-toxic, chemical free Moth Away or Cedar and Lavender Moth Balls. Try to avoid storing clothing (or bedding) underneath the bed. This is a great place to pick up unwanted pests. Trash and Donate Piles: Separate those items you’ll donate from those items you’ll simply need to throw away. Example: white tees with stains should be trashed, whereas the trendy romper you bought for only a season can be donated to the Goodwill or Salvation Army. Send your trash pile to the garbage. You can also cut up certain items to use as household and garage rags. The items you’ll be donating should be cleaned as a courtesy to the charity receiving your used items. Make an itemized list of the number of shirts, pants, skirts, shoes, etc. you are donating. You’ll need this for calculating tax deductions for next year and for your receipt from the donation center. Here is the Salvation Army’s great online donation valuation list to help you get organized. Place the cleaned and folded items in bags and take them directly to the trunk of your car. This will ensure they’ll actually make it to the Goodwill, rather than pile up in your home. Furthermore, set a date on your calendar for drop off to ensure they’ll make it out of your trunk, as well! Second, you’ll need to remove fall/winter items from your storage containers. Here is another great opportunity to assess what you’ll need for the season and what you’d like to get rid of from last year. Repeat the Trash/Donate pile process from above with your fall/winter items from last year if you find any clothes your style has outgrown. Separate those articles to hang in your closet from those to be folded in your dresser. Whenever I work with a client to organize a closet, we group items together by piece and use. For example, all suits are hung together; all dresses grouped by cocktail, work and casual styles; all dress pants, all casual pants, all denim, etc. It may sound a little exacting to the free spirits out there but it really works to help you to see what you have and what you need. In your dresser, I recommend designating a drawer for each category. For example, tees and tanks in one; socks and undergarments in another and workout gear in another. I recently used these great Dream Drawer Organizers for a client’s t-shirt and shorts drawers and he loves them. We were able to utilize his limited drawer space more efficiently and divide t-shirts and shorts into everyday and sports-oriented uses. Once your items are hung or folded in front of you, take note of what is missing that you’ll need for the season. Make a list and a plan for shopping — that’s the best part!